ClearLift™, formerly known as Pixel Q-Switch, is a virtually painless, non-ablative approach to laser skin resurfacing. Using 1064 Q-Switched laser technology, patients are enjoying fast, comfortable treatments with visible results and no downtime. The innovative technology delivers a controlled dermal wound deep beneath the skin, (up to 3mm in depth). The outer layer of the skin is left undamaged. All stages of healing and skin repair occur under the intact epidermis. The 1064 nm Q-Switched module is also indicated for tattoo removal, pigmented and vascular lesions, nail fungus and more. 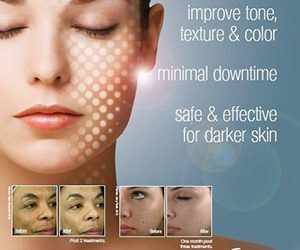 This treatment can be used on all skin types.